Dave Veenhuis, our plant operator, continually checks the regeneration plants' pH levels, pressures, flows and more throughout the day to fine-tune our multistage, resin recovery process. During the deionizing process, the DI resin attracts minerals and trace elements of the raw water, and binds these to the resin. Anion resin attracts salts. Cation resin attracts chlorides and sulfates. Both attract trace elements of manufacturing processes, such as heavy metals. In days or weeks or sometimes even months of use, depending on the production processes and demineralizing installation, the resin becomes fouled and no longer capable of deionizing. 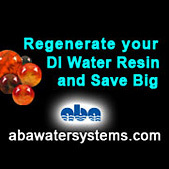 ABA Regenerates the Resin for you. When you send the exhausted resin to ABA, we regenerate the strong acid component to split the water‘s salts, and regenerate the strong base component to remove chlorides and sulfates. Throughout the process we're careful to control the chemical mix, temperatures, flows, dwell times and every other factor needed to optimize regeneration, and return to you regenerated resin that equals and, depending on the original brand and mix, even exceeds the performance of virgin resin. During resin regeneration we also strip away the environmentally-regulated byproducts of your manufacturing processes – zinc, copper, nickel, so on. ABA Water Systems is licensed to manage environmentally regulated wastes. You can sleep easy knowing we take care of the wastes handling and disposal. Need to hear more? Call – 800-257-1271 – or contact us today.